After several days of wintery type weather, today broke sunny and warm. It was calm for part of the day and the bright sunlight reflecting off the snow made it feel even warmer than it was. With the temperature getting all the way up to +39F, the snow really started melting, which is good as we were still averaging 4 inches of snow on the ground at 75% coverage. A beautiful day like today makes one think that we are going to have a spring after all. It was also the first day to see cumulus clouds building to the south, a sure sign of warmer weather. The numbers of local breeding White-fronted Geese have leveled off, but the Brant are still streaming in. In the local area, we now have over 400 pairs, as well as some of the returning last year’s young. A lot of pairs of Brant have already selected nesting sites and I found the first nest with one egg this afternoon. This puts the season about a week ahead of the average yearly start for egg laying. The first loon was sighted yesterday afternoon, a Yellow-billed Loon flying up the river. Today I spotted a Red-throated Loon fishing in the river in the morning, and another one was seen in the afternoon flying over the West Nesting Area calling and then landing in the river. We now have four pair of Long-tailed Ducks, several pairs of Northern Pintails, Greater Scaup, Tundra Swans,12 pair of Sabine’s Gulls, and a pair of Arctic Terns spending time in the melt water around the edge of our big lake or in some of the nearby tundra ponds that are melting out. The air around the house is beginning to fill with bird song at all hours now. Male Lapland Longspur napping during snow storm. Sabine’s Gull on a bright sunny day. This morning (May 27th) the last of the up-river channel ice drifted by and the river is open to boating above the Lodge. The channel is still plugged with ice on down stream of the house to the ocean. It was a long, drawn-out process this year, but in the end the only thing that was impacted was the runway being under water for several days. Depending on weather, it could take up to two weeks for all of the runway to dry out and be usable. Yesterday morning we awoke to 4.5 inches of fresh and very wet snow on the ground and the area was back to 100% snow cover. This brought the Ruddy Turnstones and Lapland Longspurs back to the feeders in large numbers. Many of the longspurs were just staying by the feeders, roosting out of the wind and snow and not going back out to their territories. With over 50 turnstones feeding with the Snow Buntings and longspurs it took lots of seed and fish to get through the stormy day. By late evening, clearing skies warmed up the day and with the ensuing melting the feeder birds started moving back out on the tundra. Even with all the stormy weather, more birds have arrived and we now have over 250 pair of brant. They, along with the other geese (white-fronted and snow), are busy checking out nesting spots in the surrounding nesting areas. New birds are American Golden Plover, Long-billed Dowitcher, Red Phalarope, Northern Pintail, Long-tailed Duck, Savanna Sparrow, and today our first pair of King Eiders. Pair of Red Phalarope’s just returned to the Arctic. Male Lapland Longspurs waiting out the storm near the feeders. Break-up continues as the river rises enough to cause minor flooding on the lower sections of the island, including our runway. With the early flooding, none of the geese that are around have started nest building, so we won’t have any nests being washed away this spring. Since the last post, more birds have arrived early with Sabine’s Gulls, Brant, Semipalmated Sandpiper, Red-necked Phalarope feeding locally. Also a Sandhill Crane, and two Whimbrel were seen flying by, headed in a easterly direction. More Lapland Longspurs have arrived and the females are becoming more numerous. The males have dispersed out around the island and have started their territorial flights, singing as they glide down to earth. I have seen them coming from as far away as 1.5 miles to feed from the feeders I have out. Several are banded from past seasons, but I haven’t started the banding for this season yet. At last count, we had 12 nest boxes being used by Snow Buntings this year. I watched the female to the nest box by the kitchen window trying to carry several ptarmigan feathers at the same time. The wind was giving her a bad time as it kept blowing the largest one out of her bill as she went to pick up some of the smaller ones. Persistence paid off and she finally headed up to the nest box with all her selected feathers. Now that she is adding feather lining to the nest bowl she is getting close to start laying. After two days of strong east winds and freezing fog, a switch to a southwest wind has brought warmer temperatures and the birds have been spending more time out on the tundra. I haven’t seen a large movement of Brant yet, but as the day continues (24th), more and more pairs are seen out in the nesting areas. Already there are some pairs fussing over the better nesting mounds and small islands. A big dark Snowy Owl had the ground squirrels on alert this morning. The owl was using their mound as a look out and they weren’t too happy about it. After two beautiful warm sunny days we are back to more normal break-up weather, low stratus and fog. The cloud cover made for a cooler day and we had a high of +31F, which slowed the melting process. The warm days in the Brooks Range restarted break-up and the water in the river has been on the rise all day and by 9 PM approaching the 4’ level. Here on our low delta island a 4.5’ water level will start flooding in the lower areas of the island, and 5’ will have the runway under water. Other than the local white-fronted geese and snow geese, there hasn’t been much movement of water fowl for the past two days. Most took advantage of the break in the weather earlier in the week to move on west. The local birds are busy checking out the near islands for nesting sites, and just local movement from there to areas that have melted out for better feeding. May18-19; We had two sparrows show up early morning on the 18th, a American Tree Sparrow and a white-crowned Sparrow. It was nice to hear them singing for the two days they were around. On the 19th an American Robin showed up, the first in several years. The robin was only here for the day. With the warm weather and melting, the birds weren’t that dependent on the feeders. The Ruddy Turnstones also continued to move through much more rapidly than I thought they would with all the snow that is still on the ground. There was just enough melting and warmth to keep them moving and not hanging around the feeders like they do when cold, snowy weather holds them. Only male Lapland Longspurs have arrived so far and only about 10 are around drifting in and out of the feeder. As of May 21, we now have three pairs of Tundra swans in the local area and you can hear them calling and watch as a pair sends trespassing swans on their way. Break-up is the next major item for us to get through. We have been busy getting those things that could be damaged by water moved around and up on higher ground. I see from the swan migration map that two of our Colville Delta satellite implant birds are back in Alaska, and the others are bunched up near the Mackenzie River Delta.. There are 10 pair of swans that are from this area that had satellite transmitters implanted in the female of the pair. This way they are able to track their migration patterns and learn important staging and timing when they leave and return to the Arctic nesting areas. We are looking forward to the pair that nests on our island and hopefully they will use the same nest site as last year. If they do we will be able to watch the activity around the nest site right from our kitchen window! 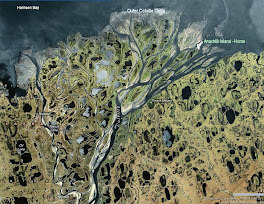 The other Swan Research Program site covers just the birds from the North Slope of Alaska and can be found at www.swanmigration.org . Besides the tracking information and maps there is a more detailed description of the banding and data collecting from the tundra swan project. This photo shows the neck collar worn by the male, just faintly the satellite antenna on the female is just visible in front of the tail. This is the pair that nests near our home. It was clear and cold all night but with the clear skies, the bright sun warmed the day up nicely. With a high of 36F there was a lot of melting, dark spots appeared all over the tundra, and puddles of water were present in the gullies. The first highlight of the day was a northern wheatear in the yard. It had the snow buntings upset as it flew around the house. I was able to get a picture of it before it traveled on. They are rare here and usually they are seen in the fall migration season. Teena and I both took advantage of the nice weather to go out sledding to see what bird life might been seen in other parts of the delta. She headed out in the morning and drove up to the lower Miluveach River where it flows into the Colville about 5 miles from home. 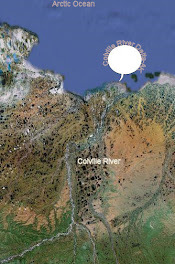 She saw several hundred white-fronted geese, either feeding in the melt areas around the river or migrating on west. A large flock of male ptarmigan, a rough-legged hawk, and many ground squirrels were also seen on her trip. While Teena was off birding, I did a goose migration watch over lunch hour and logged in 262 white-fronts in 12 flocks, and one small flock of 6 snow geese (first of season) moving west. After lunch I headed up river to check out a couple islands upstream. In about three hours traveling, I added another 700+ white-fronts, 30 snow geese, and 5 tundra swans (first of season) to the waterfowl seen moving west. Also seen on the trip was one short-eared owl (first of season), willow ptarmigan, maybe 50 ground squirrels, and 1 red fox hunting lemmings. We had one ruddy turnstone around last night and they slowly continued to trickle in all day until by 8 PM we had 12 feeding in the yard, Of those 12, two were some of my color-banded birds from years past, one each from 2003 & 2004. With more warm weather in the offering and a brisk wind forecasted out of the south to south-west, we may get more unusual birds in the next few days. The cold weather continues with a strong winds and snow out of the west. Temperatures have fallen and now stay below freezing through out the day, with the low around +12F the past two nights. With three inches of fresh snow, all the melted-out tundra ridges from the first of the month are now bright white. I haven’t seen a glaucous gull since the 8th, but the white-fronted geese keep making a swing around the area looking for an inviting spot. They don’t stay long and are soon headed back to the east or farther up river where there is more melt water, as all the overflow around here has frozen over hard again. We did have a flock of around 60 willow ptarmigan spend the night bedded down by the house. It was the first large flock seen this spring and most were males with various amounts of brown in their heads and necks. Teena made a trip to Deadhorse yesterday for mail and supplies and she saw several hundred White-fronted Geese, 50 Canada Geese, 20 Glaucous Gulls, 60 Willow Ptarmigan, a few Snow Buntings along the gravel road system, and the high light of the day for her a Rough-legged Hawk migrating east. Many of the geese including the Canada’s were seen where the road crosses the Kupurak River, which was running in places from melt in the foothills. The snowy weather hasn’t slowed our snow buntings down. They are busy defending their territories from other males and displaying for their females. The cold has stopped any nest building activity, but that will resume with the first warm sunny day. The week started like we were going to have a early breakup with the river starting to run spring flood waters. A few white-fronted geese and glaucous gulls arrived to start checking out areas for nesting sites, both were early but that seemed to be the way spring was going. But from the looks of the snow blowing past the window today, winter wasn’t quite ready to release it’s grip here in the Arctic. The open shore leads that had waves rippling on the surface two days ago are frozen once again, and snow horses are playing over the surface creating small snow drifts on the smooth ice. The geese and gulls have moved off, perhaps around the gravel road system to the east where they might find some melt water. The snow buntings haven’t slowed down as they are busy chasing each other defending their territories. The forecast holds more cold and snow so the geese may have rough going for a while. Here is a picture of one of the Black Oystercatcher I saw in Adak earlier in the Month, a first for me. It took several tries to locate a pair of oystercatchers and for a while I thought I wasn’t going to to see one. Then after watching a distant pair in Finger Bay, another pair found me the next day while I was bird watching from the town breakwater. They circled around me calling, then landed to feed not far away in the seaweed and barnacle rocks at the edge of the breakwater. I spent over a hour filming and watching them feed before they flew off on across the bay. Back home after a short trip to Adak, Alaska to visit my Son Isaac and family. While there he took me on many birding trips and I was able to add several new birds to my AK list. I will write more about birding there and post pictures later. We now have several pair of snow buntings around the buildings and at least three females are busy working on getting their nests built for the new season. So far they have been carrying more peat like material getting the foundation made, then they will finish up with grasses, caribou hair and feathers from around the yard. Using nest boxes that we have put out for them, they get a early start at nesting and about half will bring off a second brood if the summer isn’t too cold and wet. When I left on the 26th of April we were still 100% snow cover and when I returned May 4th we were down to 80% snow cover. Still a lot of snow cover left considering we had seven days straight with bright sunshine. The high temperatures ranged in the upper 30’s and one day even reached +40F. With the melting out of some of the tundra ridges, our local willow ptarmigan showed up and started staking out their territories. We now have two pair we can watch from the house and others can be heard across the river channel. The week of warm weather started the snow cover in the Brooks Range Mountains melting at a fast rate and this morning (May 5) we had flood waters around our island in the Colville Delta, the earliest by eleven days since we have lived here. There is a cooling trend moving in for the rest of this week so maybe this will slow the breakup process down some and we won’t have any serious flooding when the river ice starts breaking up and moving out. On May 4th the river ice was still 54 inches thick. In the evening we saw our first goose of the season. It was flying down river, then it turned over towards the runway where a large area of vegetation is melted out. It was last seen flying off to the east.